Who thought you can eat zucchini leaves? Well, Italians have been using as much of the plant as they can, using it’s flowers, fruits and even the leaves. Zucchini leaves are particularly good toss in with a freshly made pasta sauce like a simple Sugo Di Pomodoro or even Spaghetti Con Aglio e Olio. 1. Using a large pot bring salted water to a boil (you can also add a couple lemon slices). 2. 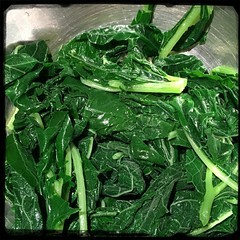 Rinse, dry and cut up the zucchini leaves. 3. Toss in the cut up zucchini leaves, cover and let the water return to a boil. 3. Remove leaves and place in large bowl with cold water and ice cubes.